Association leaders and members who turned up to keep a watching brief at the court after the delivery of judgment. Some members of the churches pray outside the court room. 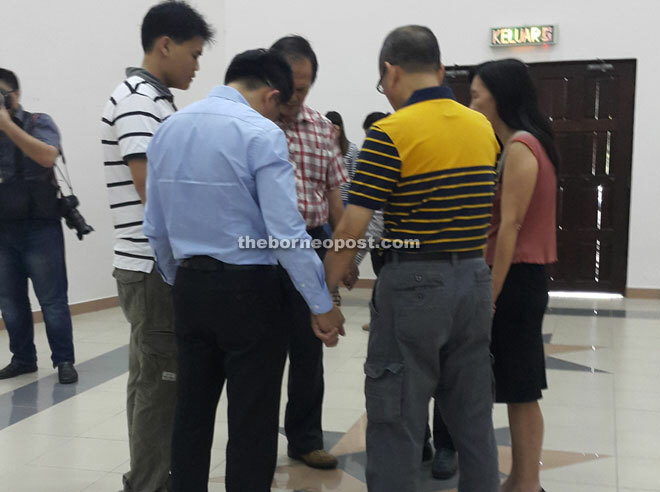 KUCHING: The High Court here yesterday allowed a Bidayuh man, who was converted to Islam as a child by his parents, to renounce his religion and become a Christian. Justice Datuk Yew Jen Kie made the decision on application made by Azmi Mohamad Azam Shah @ Roneey Rebit,41, who was converted when he was 10 years old. The decision was delivered without the presence of the applicant who is currently working overseas. Yew made the declaration that the applicant is a Christian, and ordered the first and second respondents to issue letter of release from the religion of Islam, and also his name to be changed from Asmi Mohamad Azam Shah to Roneey Anak Rebit in his identification card as well to change Islam in his identity card at the National Registry to Christianity. In passing the verdict, the judge said the decision was made under Article 11 of the Federal Constitution, which guaranteed freedom of religion. She said the applicant converted when he was a minor and following his parents when he was just 10 years old, he had no choice and not his volition and hence, the applicant cannot be considered as a person professing the religion of Islam. But now he has the right as he has reached the age of maturity, and furthermore, he was baptised a Christian in 1999, the judge said. Roneey was represented by a team of counsels comprising Chua Kuan Ching, Simon Siah and Cindy Chow from Simon Siah, Chua and Chow Advocates. The first, second and fourth respondents; namely Sarawak Islamic Religious Department, Sarawak Islamic Council and the state government were represented by state legal counsel Hisyammudin Roslan while director-general of National Registration Department (third respondent) was represented by senior federal counsel Leo Saga. Cost of RM5,000 was also imposed. Prior to the application, the first and second respondents agreed to issue the Letter of No Objection to Come out From Islam to the applicant but the third respondent had insisted an order to be obtained from the Syariah Court. The leave application for judicial review was granted by the Court which ruled that Azmi had no choice but to adhere to his parent’s wishes as he was a child at the time. The Court had also said the conversion was not done of his own volition, so he could not be considered a Muslim and hence was not subject to either Syariah Court’s jurisdiction or the Federal Court’s decision on the Lina Joy case. The same judge also said the Court had jurisdiction to hear Azmi’s case as it involved the rights of freedom of religion, which is guaranteed under Article 11 of the Federal Constitution. 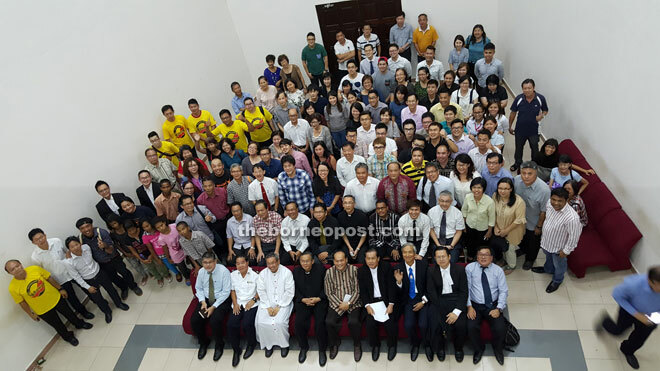 Keeping a watching brief on the case were members of Advocates Association of Sarawak (AAS) and Association of Churches in Sarawak (ACS), Kuching Ministries Fellowship (KMF) and Buddhist Association as well as the applicant’s relatives. This is a landmark case in the High Court here involving conversion out of Islam in the state.